Tanaza is a multi-vendor software that supports a large range of access points, providing its customers with scalability and control over their hardware budget. To remain closely focus on Tanaza customers’ requirements, Tanaza set up a way that allows customers to upvote for the hardware they expect to find. This way, our Engineer team can give priority to a specific hardware or version rather than another one. 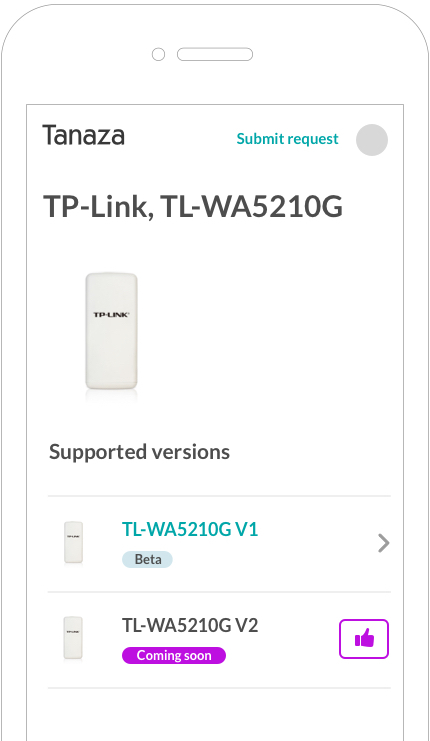 For example, on the screenshot, you can see that at present, Tanaza supports the TP-Link TL-WA5210G version 1 in beta and that it could soon support version 2 as well if upvoted as one of the priorities by Tanaza customers. Moreover, if an access point model is not supported yet and doesn’t appear as a “coming soon” device, users can fill in a form to request a specific device. By doing so, the Tanaza Engineer Team is trying to get the closest possible to Wi-Fi professional needs. Being multi-vendor means that the Tanaza software is compatible with many access point vendors like Tp-Link, Ubiquiti, NetGear, Linksys, MikroTik, Engenius, etc. Visit our Success Portal now to find out the list of supported access points by Tanaza.